Faiza Sadaqat Ali Civil Hospital, Karachi. Tazeen Raheed Dow Medical College Dow University of Health Sciences, Karachi. Majid Ahmed Shaikh Dow Medical College Dow University of Health Sciences, Karachi. 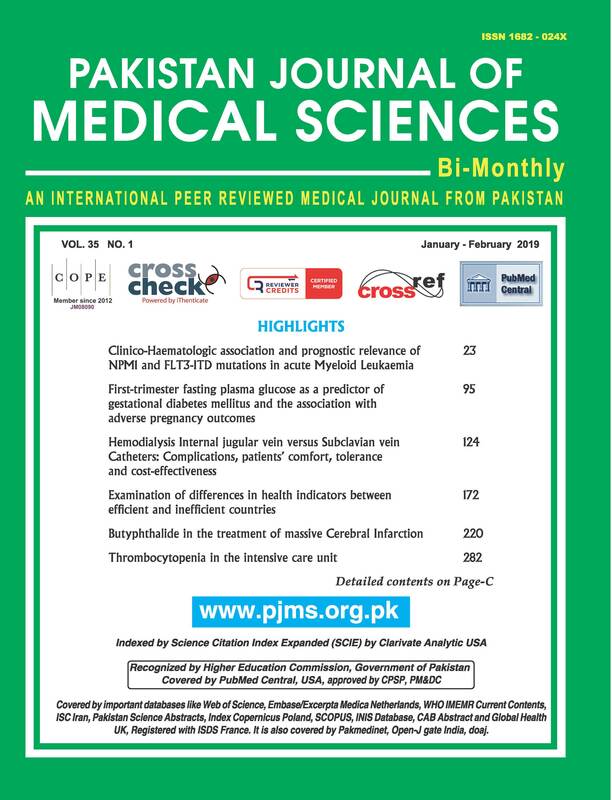 Objective: To determine level and factors of job satisfaction among doctors working in tertiary care hospitals in Pakistan. Methods: This is a multi-center cross-sectional survey conducted among Post graduate trainees, medical officers, consultants and faculty doctors. Job satisfaction was measured using 35 specific questions about sources of work-related stress and sources of work-related satisfaction. Satisfaction was defined if mean score of a factor was ≥3.0, where factors were rated using a 5-point Linkert scale ranging from 1 (completely dissatisfied) to 5 (completely satisfied). Results: In this study 373 doctors participated, out of which 215(57.6%) were males. Over all mean satisfaction score was of 2.69±0.37. Departmental mean satisfaction scores were Internal medicine 2.71±0.35, Medical subspecialties 2.63±0.38, Surgical and allied 2.73±0.45. Designation means were Consultant 2.87±0.38, Faculty 2.78±0.44, Medical officer/Registrar 2.50±0.32, Post graduate trainee 2.71±0.45. Public and private sector means satisfaction scores were 2.53±0.80 and 2.92 ±0.84 respectively. Conclusion: Job dissatisfaction was seen among doctors from all the tiers and departments. Public sector doctors were more dissatisfied than private sector doctors. Increasing age, duration of current posting and working experience, positively correlated with satisfaction level.